Enerpac (A Division of Actuant Corp) has introduced a new 5000 kN hydraulic lifting gantry that delivers industry-leading standards of safety and stability when lifting heavy loads to heights exceeding 12 metres. Featuring a completely new design, the MBL5000 hydraulic lifting gantries are engineered to operate in confined areas with roller track self-propulsion that reduces the footprint load of the gantry by more than 50 per cent compared with regular steel wheels. 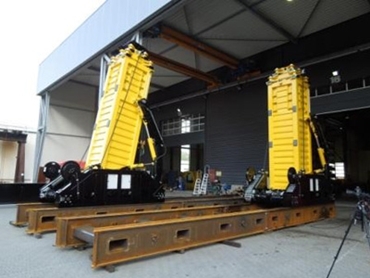 The MBL5000 is a more evolved version of Enerpac’s SBL series of gantry lifters, already widely proven in lifting heavy plant, machinery and components in applications such as mining and energy developments, oil and gas plants, bridges and civil engineering, and ports and infrastructure. Extending upon the product features in the SBL series, the MBL5000 incorporates roller track self-propulsion; Intellilift wireless control system with automatic synchronisation and overload detection; foldable boom design, facilitating transport inside a 20’ container and enabling access to confined areas; ability to absorb all side loads in the steel boom structure and not in the hydraulic cylinders; pre-tensioned sliding bearings between the boom sections to minimise boom drift and possible overturning; and maximum lifting height of 12.8 metres with only two full hydraulic and synchronised stages, reducing boom drift by more than 30 per cent. Enerpac Integrated Solutions Manager for Australasia, Mr Richard Verhoeff explains that the totally new design responds to strong market demand for higher capacities and lifting height, which, in conventional designs can jeopardise stability by pushing safety factors to the limit. According to Mr Verhoeff, overturning and side load boundaries can easily be breached when a gantry is not perfectly levelled. In many cases, lifting operations today can start at the limits of what is allowed, with the safety factors reduced due to sometimes unavoidable ground settlement. To expand safety factors to previously unachievable levels, Enerpac decided to design the new MBL5000 gantry to provide the safety and performance standard of the future. Enerpac has prioritised safety and performance by including all features such as self-propelled tracks and wireless fully controlled synchronisation systems as standard in the new MBL5000 lifting gantries. By designing the hydraulic system within the assembly, no trailing hydraulic hoses are exposed in the working area, and only an electrical power connection is required. To ensure safety and provide certification, all MBL gantries are tested under the supervision of an independent third party (Lloyd’s) at 120% secure workload, 2.5% side load and not more than 80% of the overturning moment allowed (110%, 1.5% and 90% respectively are allowed by regulations). 5000kN lifting capacity over the entire stroke; Full extended height: 12,800mm; Power supply 4 x 11kW electric, 380-600VAC, 50 or 60 Hz; Operating speed 8000mm per hour; Low load/high-speed functionality for quick commissioning; Fully electronic, wireless synchronisation system with overload shut off; Compact transport dimensions (will fit into a 20’ container); Unit weight 18,750kg; Self-contained hydraulics and electrics; Full range of support products such as tracks, beams and sideshift.